An 8,000kW rescue tug, the first vessel installed with ABB’s Azipod D electric propulsion system, has been delivered to customer Guangzhou Salvage Bureau, a division of the Chinese Ministry of Transport. Prior to delivery, the tug, built by Huangpu Wenchong Shipyard, exceeded design targets in bollard pull, fuel economy, manoeuvrability and low-load performance in sea trials. 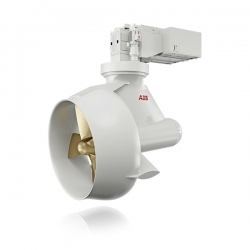 According to ABB, the Azipod D product portfolio, which is available across a power range from 1.5-7.5MW, incorporates thruster technology enabling installed power savings of up to 25%, less maintenance and reduced fuel consumption and emissions.